Collection and analysis of existing regulations and classifications related to management of cultural sites with regards to natural hazards. long term restoration and conservation. Analysis of leading edge methodologies in surveys and diagnosis both for prevention and early detection of natural hazards damages. Assessment of existing methodologies and different approaches in restoration and conservation, focussing on the mitigation of natural hazards effects. Elaborating feasible proposals to update existing government procedures. Discussing and involving (in collaboration with WP10), opinion leaders in a periodic discussion to assess proposals. Assessing a structured set of government policies with two updates (one before the experiments start and another after the evaluation of results). Proposing implementation strategies for those policies an European and National levels. Identification of uses cases that correspond to STORM vision and can lead to the selection of appropriate evaluation and testing scenarios. Capturing of STORM system and user requirements. Definition of specifications for the STORM system, following the requirements capturing process. Identification of the integrated human/machine sensor data collection framework. Provision of the overall system architecture. Develop novel sensors and adapt existing ground-based sensors for environment and Cultural Heritage monitoring. Elaborate damage assessment technology based on photogrammetry, InSAR, LiDAR, UAVs and WASNs. Implement a light sensor data communication schema based on the use of state of the art protocols adopted in IoT systems. Identification and assessment of natural hazards (slow and sudden onset) taking into account future alterations due to climate change. Assessment of all potential vulnerabilities and risks related to specific cultural sites. Derivation of risk management strategies and definition of actions. Implementation of risk management strategies related to identify Cultural Heritages. Provide machine interpretable models of knowledge and standard specifications for representing real events in the STORM application domain. These models must be designed to represent the critical situations involving Cultural Heritage and support recovery actions. Provide techniques and methods for deriving relevant events for Cultural Heritage and correlating information incoming from multimodal sources. Provide services for situational awareness, decision support and coordination of the critical situation management. Select and support the adoption of technologies, devices, and systems for real-time monitoring and quick damage assessment of goods. Provide innovative, cost effective, non-invasive and non-destructive method and process for survey and diagnosis. Collect and share the knowledge on the potential threats, vulnerabilities, risks, as well as the actions performed to manage in a suitable way the critical weather events, putting in the loop both the own experience and skill. Make more resilient the communication among the stakeholders during or in the aftermath of a weather disaster when, as often happens, the main communication services are collapsed. Collect, contribute and share information and data from the disaster site leveraging on a crowdsourcing approach able to collect information in real-time and redistribute the tasks based on needs that appear in–site from the first responders and citizens. Provide required Web based GIS tools and services specified in WP3. The aim of this work package is the implementation of the STORM integrated system through a strict collaboration among all the Consortium partners in order to realize the integration of all the involved architectural components. The integration activity builds up on the work already done within the components’ development WPs (i.e. WP3, WP4, WP5, WP6), as well as the requirements and the system architecture defined in the context of WP1 and WP2. Plan and implement the STORM integration strategy platform using the “Integration Tree” approach. Define and develop a set of personal device applications able to support both citizens and emergency operator before, during and in the aftermath of the disaster. Deploying real environments for the final testing and validation of the specific use cases. Definition of the experimental scenarios, according to use case scenarios and requirements defined in WP3. Planning of trials and setup of experimental sites (running in two rounds). Perform and coordinate the experimentations across different sites (Italy, Greece, UK, Portugal, Turkey). Definition of KPI to assess and validate the results collected by the STORM cultural sites. The experimentations provide the project team with feedback and lesson learnt, which allow the project to improve its results (i.e. iterative and incremental improvement process). The results coming from the trials is exploited to define and consolidate the recommendations for policies and government/governance processes (WP2), as well as to disseminate project results (WP10) and to define the sustainability model (WP11). This WP concerns a wide involvement of Cultural Heritage sites, administrations and associations in Europe as potential end-user of STORM infrastructure. In the meantime, the dissemination of the project results which is also a strategic task in that the impact of the project should reach as many as possible European administrations in order to really spread out the culture of disaster resilience tracking and promote its adoption and implementation all over Europe. As such it entails the definition of the Dissemination and Communication plans, the implementation of the communication materials (brochures, logo, visual identity) for the project, the setup of the project web site and a strong action of liaison with other on-going project and existing networks operating in the same area, with many of which some STORM partners already have ongoing cooperation. Proper dissemination level measures are taken during project course. Creating a public space for a European debate that reflects diverse cultural and historical landscapes and where resilience experts and intellectuals from different cultures are represented on an equal basis. Promoting the participation to STORM Model and validation/results obtained through the trial actions. Managing and updating the contents of STORM regarding promotion and dissemination. Producing a Communication Plan to push the STORM take-up. Organising proper training of the project outcome. Fosters future evolution and valorisation of STORM methodologies and services. Gathers feedback on the sustainability plan from relevant stakeholders, in order to build consensus and interest. Focuses on the realisation of a business model in order to assess the exploitation perspectives of STORM methodologies and services. This work package is fundamental for guaranteeing the success of STORM, its wide impact and its future sustainability after the project deadline. 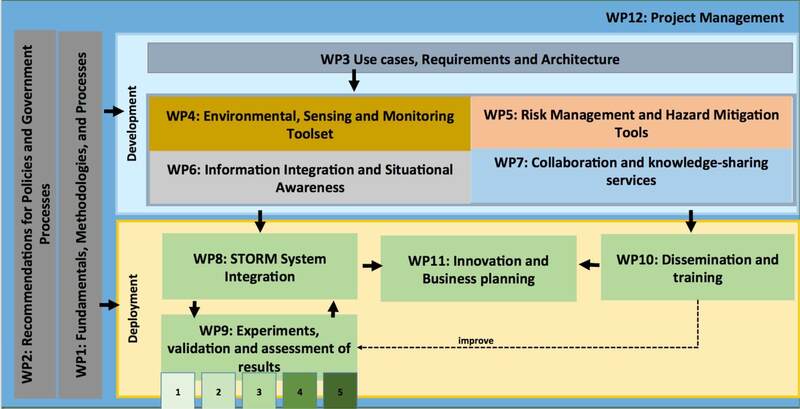 Relevant stakeholders identified are actively involved in the WP in order to draft the sustainability plan based on users’ feedback, and to foster the adoption of the STORM approach in disasters resilience. Moreover, individual exploitation purposes are identified by all the partners to guarantee the continuation of the project outcomes. To provide overall project management and coordination. To ensure the quality management and assurance. To maintain the information flow between partners. To provide administrative and financial control according to work plan. To coordinate the dissemination and promotion activities and to present the project towards the European Commission.